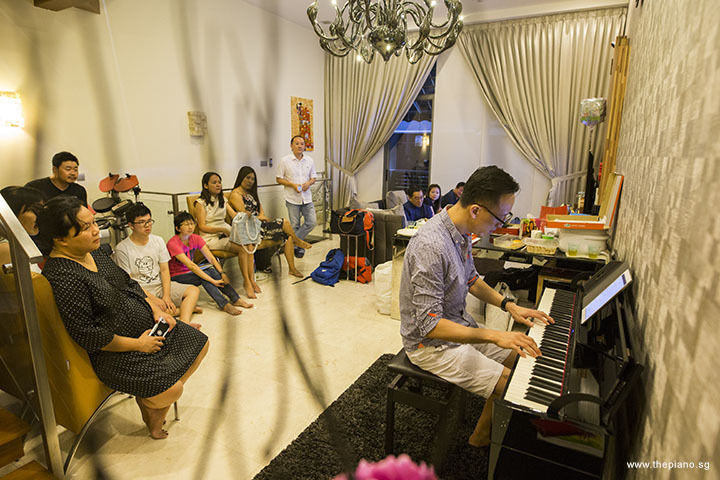 Every now and then, we at ThePiano.SG add flavour to Pianovers Meetups, a weekly gathering during which we bring together people who are passionate about the piano. This was exactly what we did for Meetup #51. This session was a mooncake-themed one, to coincide with the arrival of the Mid-Autumn Festival! 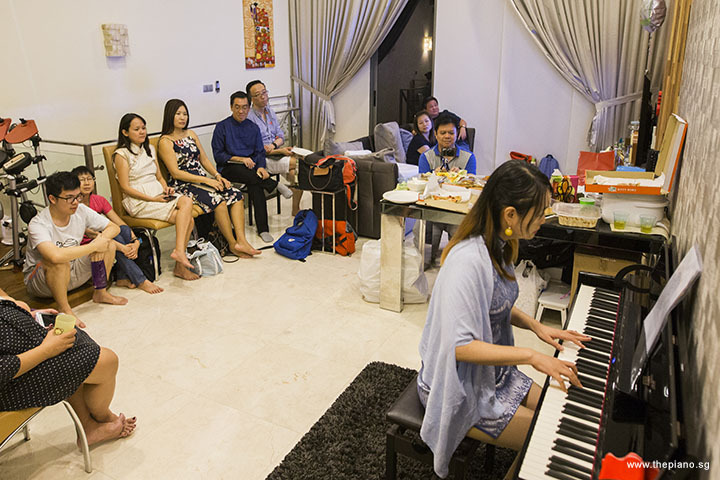 Held at the residence of Junn, one of our Pianovers, this was a special event that saw people arriving in their traditional attire. To participate in the festivities, Audrey turned up in a very elegant modern design cheongsam. 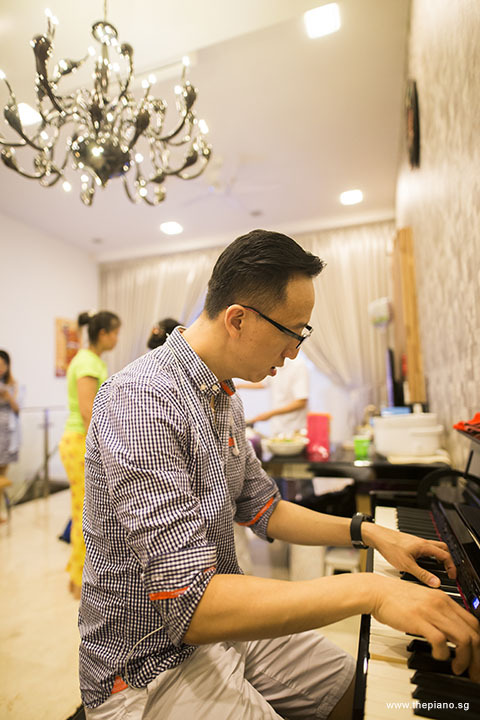 So did Chris, one of our regular Pianovers, who came in a splendid-looking traditional Mandarin-collar attire. 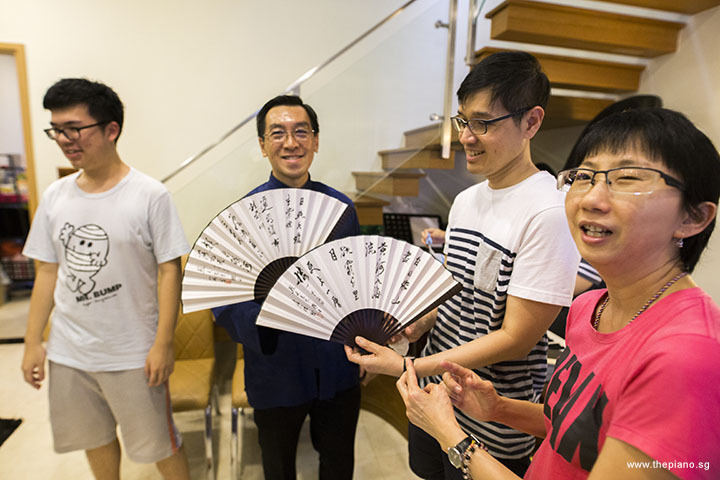 He completed the look with a traditional Chinese fan, printed with Chinese calligraphy, which he invited Pianovers to read and decipher the meaning of. In the spirit of the Mid-Autumn Festival, some Pianovers arrived with mooncakes. 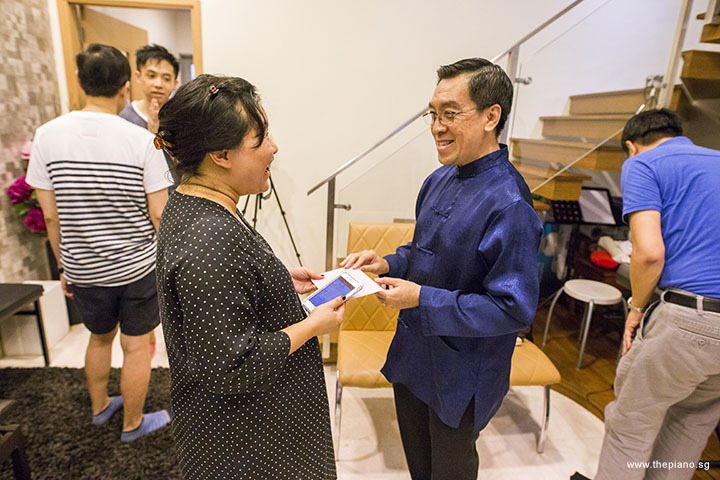 Others came with presents and red packets for Junn’s newborn, Beatrice. Junn, the host, had her own part to play. She personally made tiramisu to share with the group. 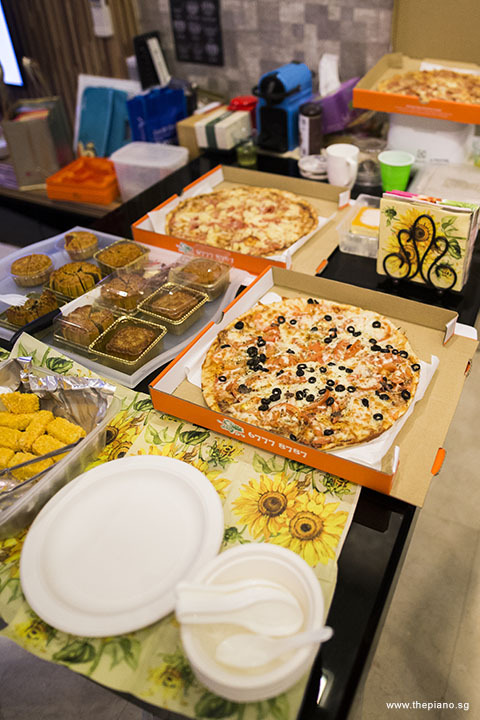 Apart from dessert, there was lots of food – pasta (cranberries, walnuts, baby spinach and seaweed with sesame seeds), chicken wings, fish fingers, mooncakes, pizza, mango mousse cake and apple cider drinks! It was truly food galore! Because Junn’s space was limited, we had to limit the number of guests who arrived this evening. The good news was, the event was fully-subscribed! 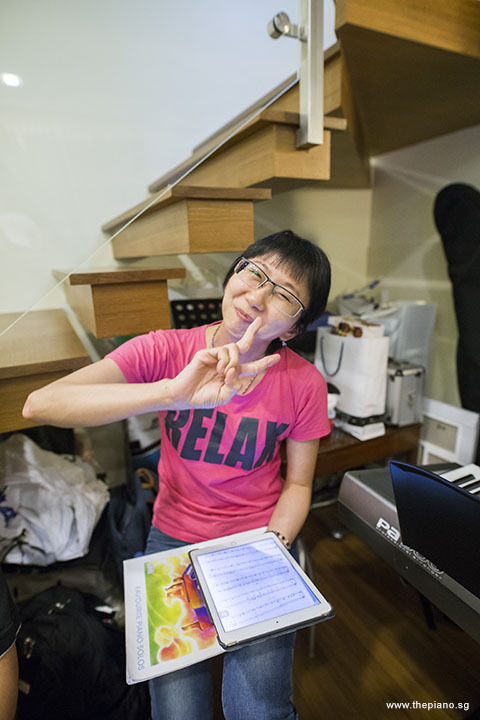 We Pianovers would like to thank Junn for her kind hospitality and for being such a wonderful host! 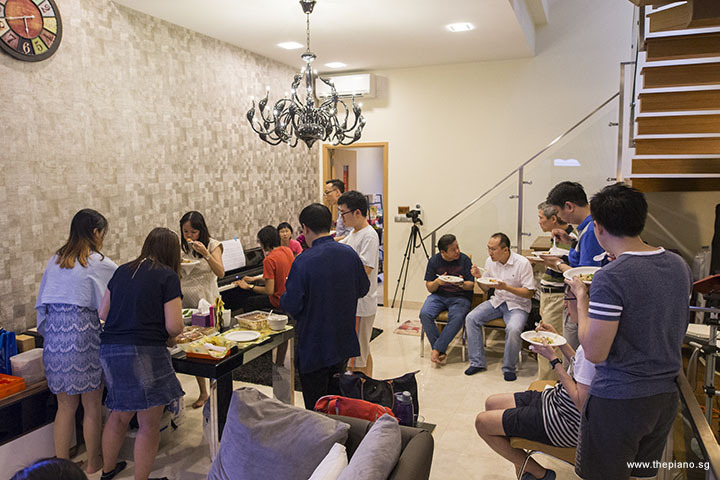 That our Pianovers participated fully and contributed in their own little ways in Pianovers Meetup was testament to the very essence of ThePiano.SG. 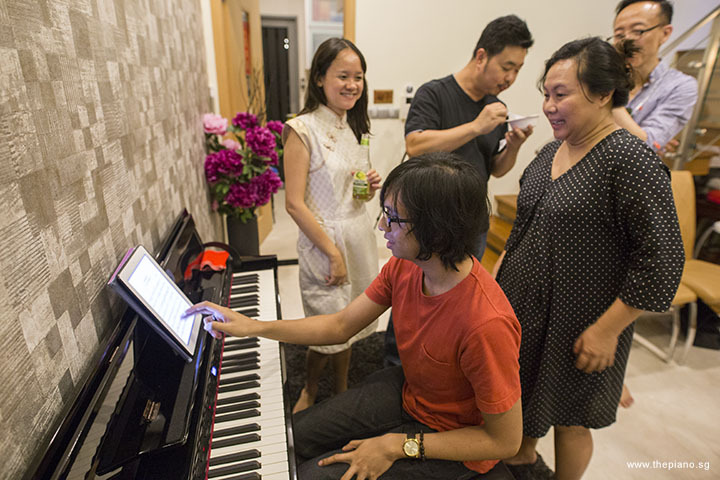 One of our missions is to bring the piano to the masses and to build a cohesive, inclusive community of paino lovers, and we are very heartened by those who actively participate and contribute! 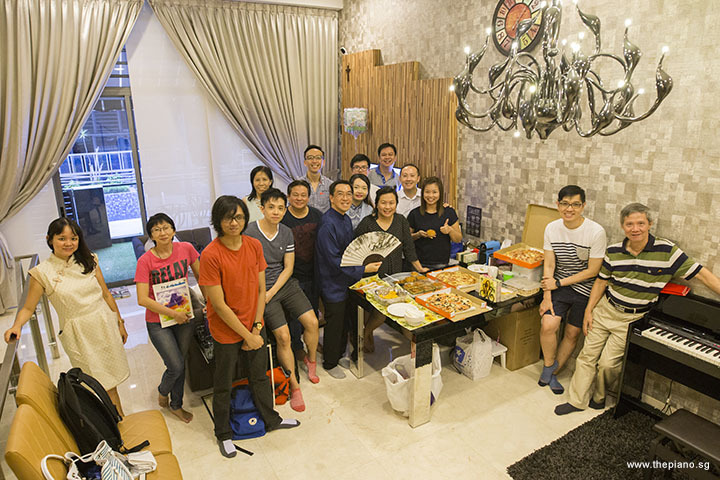 Having settled down at Junn’s place, we had dinner and mingled around, before taking a group picture around the table of gastronomic goodies. 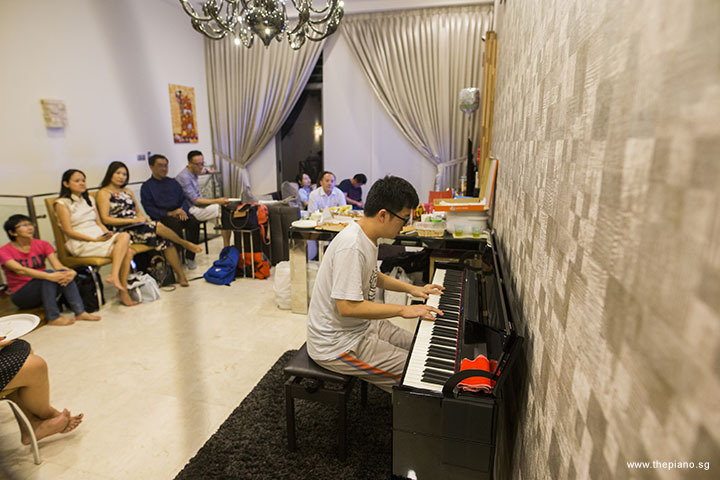 Needless to say, music was a natural accompaniment to any Pianovers gathering! 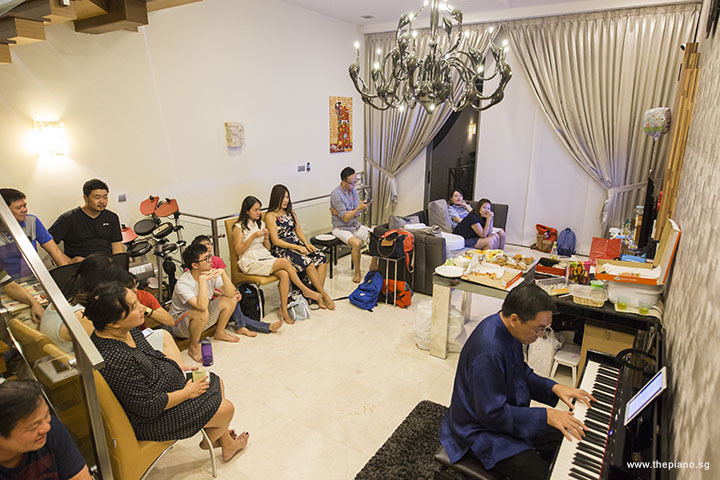 This being a gathering of Pianovers, obviously some had already started playing the piano upon arrival. There was no lack of music throughout the meal! 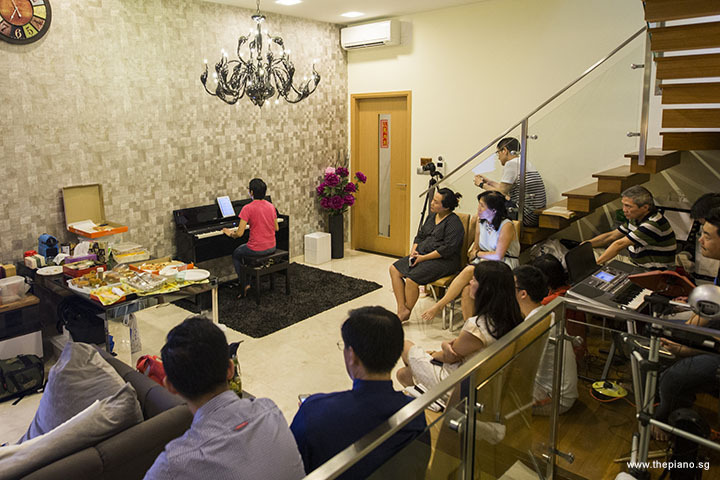 After dinner was completed, Sng Yong Meng, the Founder of ThePiano.SG, gave a short presentation. He took the opportunity to make some important announcements. 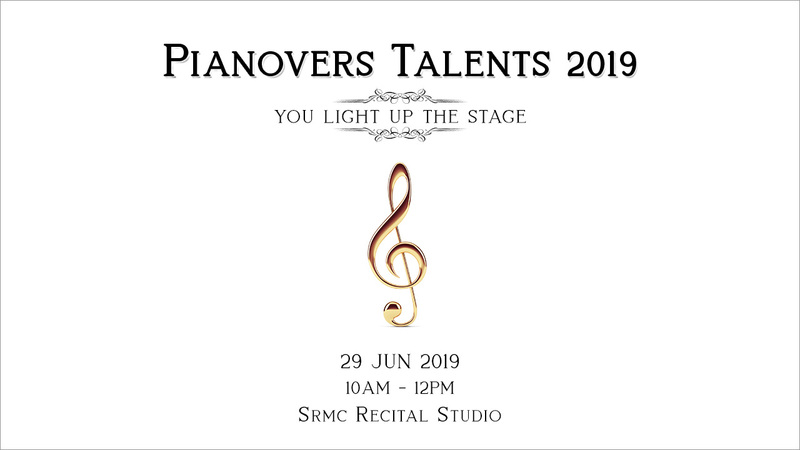 The logo of ThePiano.SG, as well as the term “Pianovers”, are now officially trademarked. Yong Meng also announced the soon-to-be-launched Pianovers Rewards Card. The only card of its type in Singapore, this is the membership card that a piano lover will ever need for all his or her piano needs. 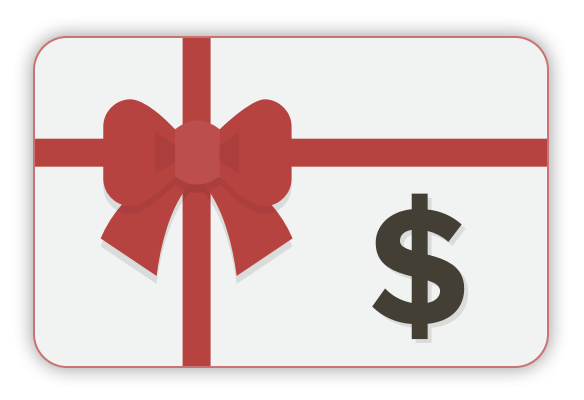 Designed by Pianovers for Pianovers, the Pianovers Rewards Card unlocks exclusive discounts and benefits for Pianovers, and complements your musical journey with the wide range of products and services offered by our carefully-curated panel of merchants. At 6:30pm, we kicked off the Meetup proper. This evening’s Mini-Recital began! 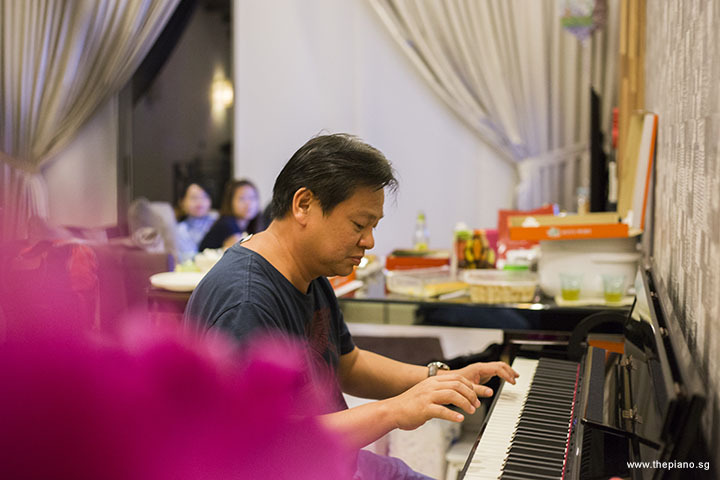 First at the piano was Teik Lee, who played Moon River by Henry Mancini. Although this piece was composed a while back, it took on popularity as it was used in the movie “Breakfast at Tiffany's” in 1961. The lyrics were written by Johnny Mercer. Interestingly, there is a body of water in Savannah, Georgia (Mercer's hometown) that is named Moon River. This name was given in honour of Mercer and his song. Siew Tin was up next. Known for her signature Chinese classics, Siew Tin did not disappoint. 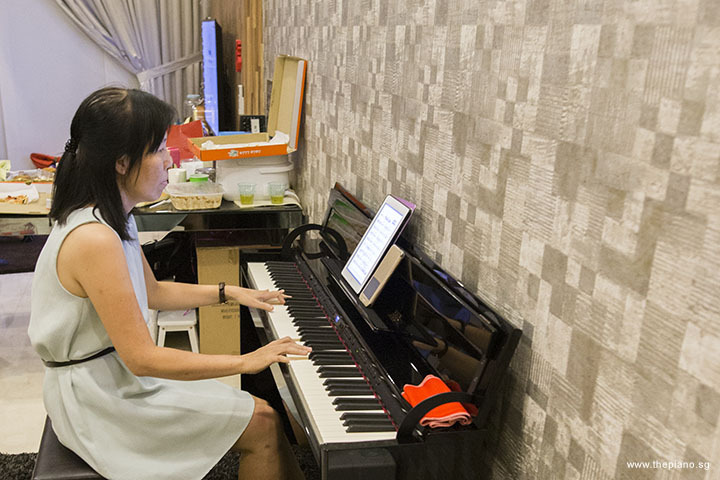 She played 星月神话 by Chinese singer/composer 金莎. This song was compiled in her 2010 album, and was also used in the 2010 神話 television series. It was based on the 2005 movie of the same name starring Jackie Chan. Interestingly, Jackie Chan was the main producer of the 2010 version. Karen performed the Theme from Moonlight Sonata 1st Movt. Officially, this composition is known as Piano Sonata No. 14 in C♯ minor "Quasi una fantasia", Op. 27, No. 2. It was completed more than two centures ago, in 1801, by Beethoven, who dedicated it to his pupil Countess Giulietta Guicciardi, the following year. What some may not know is that this famous piece was not given the name by Beethoven himself. It was the German music critic and poet Ludwig Rellstab who gave it the name Moonlight Sonata, five years after Beethoven’s death. Following this piece, Karen performed her second piece, Moonlight On The Snow by Regan Starr. Wenqing was up next. This evening, he brought us 月の砂漠 (Moon's Desert) by Hisashi Sasaki. This is a popular children’s song in Japan. 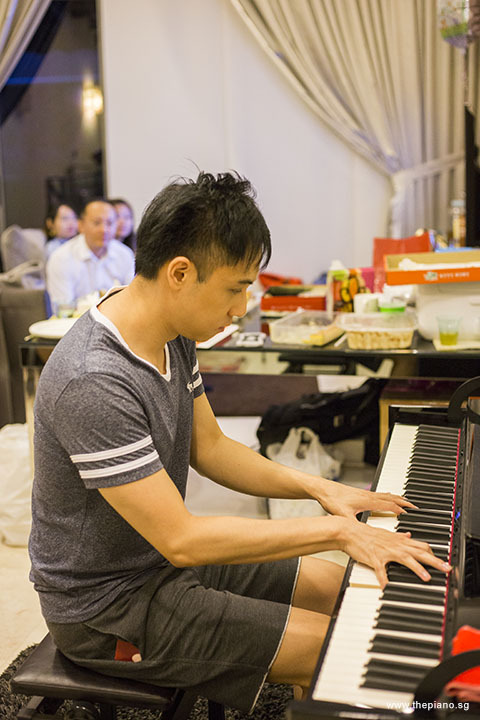 Following Wenqing’s performance, Zhi Yuan came up to the piano, armed with two Chinese pieces 女人花 by 陈耀川, as well as 夕阳之歌 by Kohji Makaino. Both pieces were famously played by 梅艳芳 (Anita Mui). On 5 September 2003, Anita announced at a press conference that she had contracted cervical cancer. Her sister had also passed away from the same disease. Two months after that, Anita performed in her farewell concert, during which she donned a wedding gown. Anita lamented her biggest regret, which was not having had a wedding, and urged the ladies in the crowd to treasure the people around them and hold on tight to their happiness. Anita passed away on 30 December 2003. 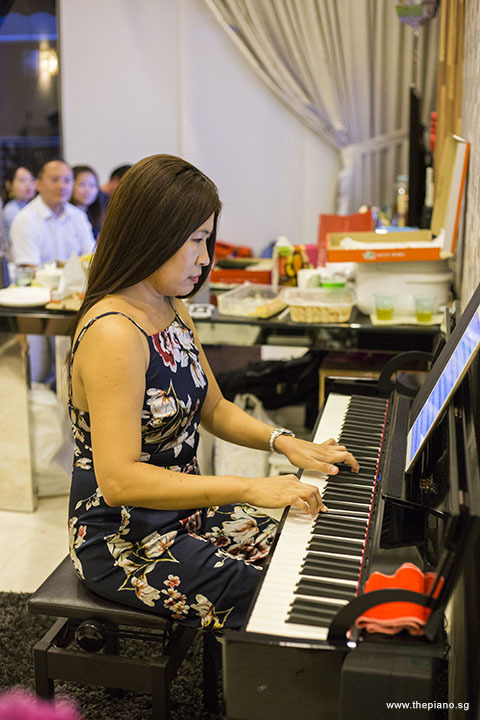 May Ling came up to the piano next and played Moonglow, composed by Will Hudson and Irving Mills. Also known as Moonglow and Love, this is a popular song from 1933. It is a foxtrot (a smooth, progressive dance wtih long, continuous flowing movements), typically played at a slow tempo. Some performers, however, have played it faster. In the visual form, the dance looks similar to waltz, although the rhythm is in 4/4 instead of 3/4. Following May Ling’s completion of Moonglow, Albert came up and delighted us with another Chinese classic, "明月上高樓" by 梅翁 (Mei Weng). There is a poem by the same title, written by 曹植 (Cao Zhi), the third son of 曹操 (Cao Cao), which hinted at the bad relationship between himself and his brother 曹丕 (Cao Pi). This was reinforced by another poem, 七步诗 (Seven Steps Poem). Cao Pi was jealous of his brother Cao Zhi’s poetic skills and ordered him to write a poem in which he could only allude to their relationship but not mention it explicitly. Such was the tension between the two brothers! Gladdana played 天台的月光 by Jay Chou. 天台的月光 was a 2013 musical film from Taiwan, and was the second feature film directed by Taiwanese singer/actor Jay Chou. It took on a similar concept from his first feature film, Secret. In Secret, Jay played multiple roles in film production – He was the main lead, director, script-writer and music composer. Chris performed 月儿像柠檬 (The Moon Is Like A Lemon) by 红叶 (Red Leaf). This piece was performed by the late Teresa Teng in 1970. At that time, some of her fans commented "爱就如那柠檬: 清香、真实而圆满 " (Love is but like a lemon, round, fragrant and with substance). Last but not least, Gee Yong entertained us with 月亮代表我的心 (The Moon Represents My Heart) by Weng Ching-hsi (翁清溪 ). Under the old Communist China’s rules, foreign music was not allowed into the country for a long time. This changed in in the late 1970s when the country adopted an Open Door Policy. "The Moon Represents My Heart" became one of the first popular foreign songs (called "gangtai" songs) in the country under the new Open Door Policy. This song represented a stark contrast to the songs prevalent before the Open Doors Policy was instituted (the existing songs were often revolutionary songs). Teresa was honoured to have been given the opportunity to perform in China, however, she unfortunately died of an asthma attack in 1995. Following the end of the Mini-Recital, we moved into the Open Segment. Here, Pianovers jammed on the piano, chatted and bonded over food. 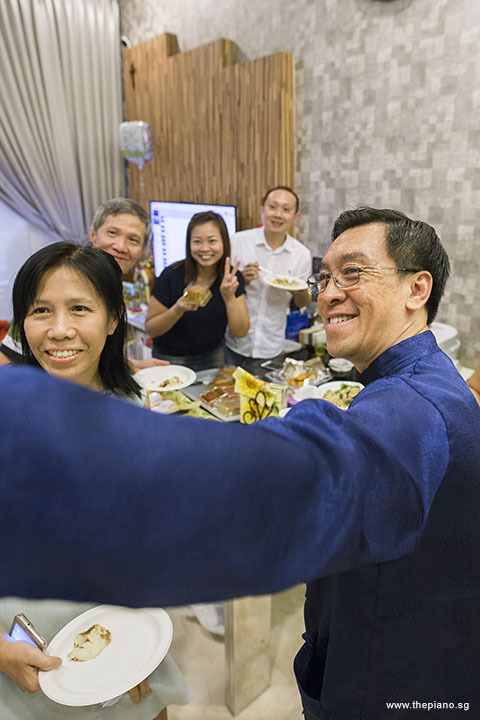 Yong Meng announced that Nicholas, who had been taking many photographs for the Meetups, would “retire” in order to focus on his other commitments. Thank you very much, Nicholas! You have been great help to Pianovers! Pianovers Meetup #51 ended at 9:30pm. 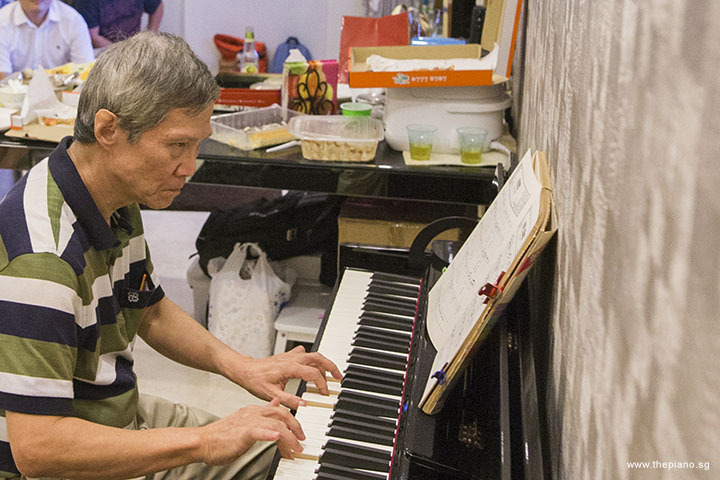 A big thanks to the many Pianovers who helped clear the table and restore Junn’s house to its original state! 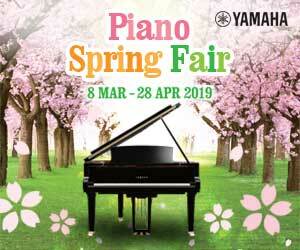 Once again, a big thank you to Junn for hosting us and to all Pianovers who arrived. We enjoyed your company very much! 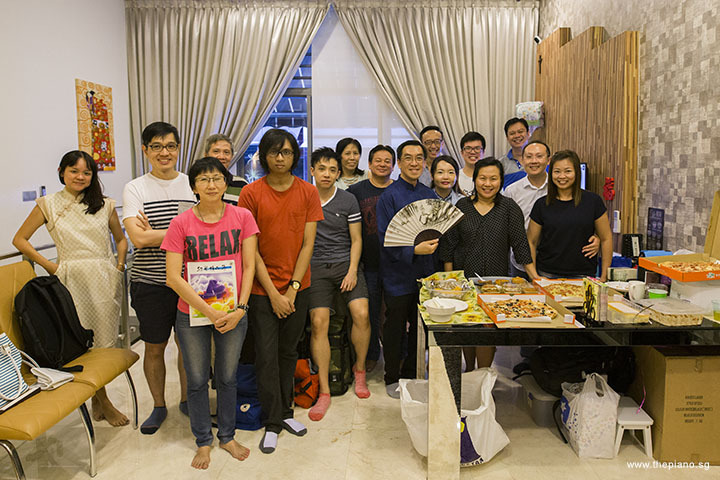 See you all on Sunday for Meetup #52 at The URA Centre!